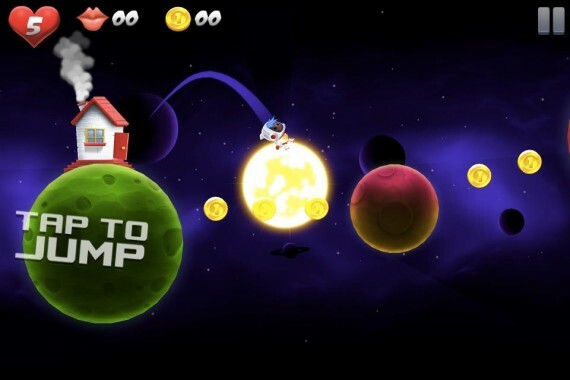 Ever imagined what would happen if you crossed Super Mario Galaxy with Jetpack Joyride? Well you don’t need to wonder anymore because Crescent Moon Games have gone ahead and made it a reality with the delightful mobile game romp Space Chicks. 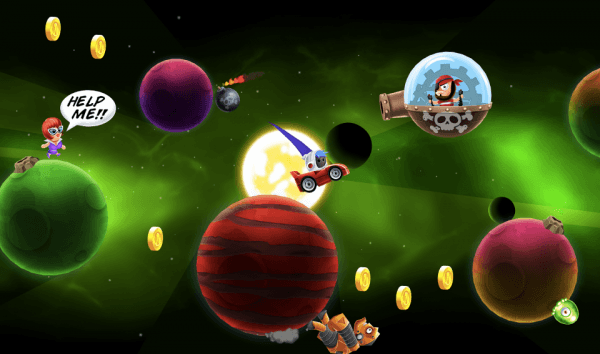 Space Chicks blends the gravity based platforming elements of Super Mario Galaxy with the endless running casual fun of Jetpack Joyride to incredible results. The game is a lot of fun and with its wildly addictive gameplay you’ll be hooked. If you’re looking for the next big thing in mobile gaming, this is it. This is Space Chicks! When it comes to casual accessible fun, Space Chicks has it down to a tee. It proves to both be heavily engaging while simultaneously perfect for casual play of a couple minutes on the go. It captures the perfect balance that makes it the perfect game for all occasions, be it intense gameplay sessions or a chilled out play through. The game places you in outer space with the goal of saving the titular chicks in space from a variety of different enemies. You jump between gravity pulls of asteroids and planets with a simple one touch control scheme. When on a planet or asteroid your character runs around it full 360 until you jump off. You must pick up chicks along the way and drop them off on space ships for safety. When travelling between stages you are placed in a space ship of your own where you engage in Jetpack Joyride style play which involves you holding down on the screen to fly your ship higher and release your touch to lower it. As you progress further through the game and complete more and more stages you will encounter more difficult enemies that prove to be very intelligent and quite a challenge as well. Not only does the game provide an amazing single player experience it is also fun for two players in its multiplayer mode. The multiplayer mode has two players using one device with either side of the screen controlling each character. It is an effective mode that works quite well despite becoming a little cluttered at times. While it is a lot of fun, the cluttered gameplay that comes with multiplayer can be problematic. It is advised that players stick to the superb single player experience on offer in Space Chicks. That’s not the say that the multiplayer mode isn’t a fair bit of fun in its own right, it just becomes somewhat frustrating after a while due to difficulty with screen visibility and control becoming a fight in and of itself. It can be fun though for a little while, but the real fun is definitely in the single player. There is also a fair amount of customization that can be unlocked the more coins you earn in game. Such unlockables include different costume and power-ups (not unlike that seen in Jetpack Joyride). There is also the standard leaderboards to which you can compete against other players around the world to see who is the best at Space Chicks. It is also great to track your own progress and development as you play through this awesome game. All in all the majority of the game is essentially an endless runner but with an unique gameplay element hook that makes it feel fresh among the crowded mobile games platform. Space Chicks’ graphics are colourful and fun adding to the entertainment value of the game itself. The aesthetics are memorable and well suited to this style of game, there is a certain flair to Space Chicks that is simply undeniable. It is a special artistic creation that harkens back the spirit of old 2D Nintendo games and the charm that comes with it. The soundtrack for Space Chicks is an excellent composition with memorable tunes that will stick in your head long after playing. The musical composition here adds a great deal of atmosphere to the game giving it a playful vibe that fits just right. Crescent Moon Games have done a great job here to make a soundtrack that is truly memorable. It is the right backing music for Space Chicks and it really adds a lot to the game. 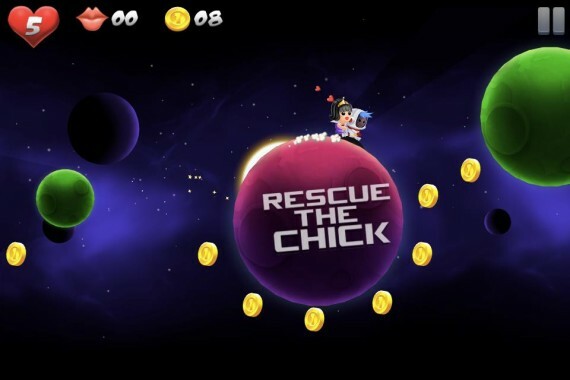 What Space Chicks brings to the table is innovative gameplay that changes what the platforming genre can be on the mobile platform. This is the next big thing in mobile gaming. 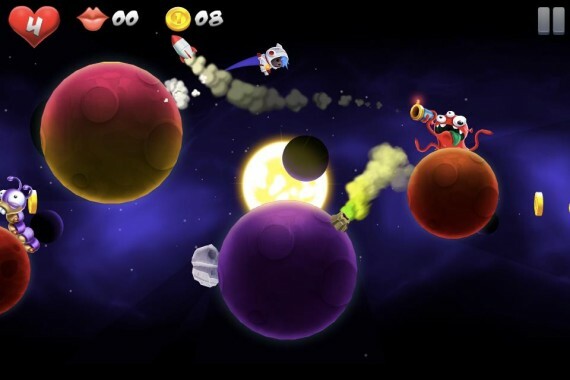 Space Chicks is as addictive as mobile gaming gets and it is a must-play for fans of the endless runner genre. What more can I say? Space Chicks is out of this world!